Sean Ervine says he will be proud to become the first to play 100 T20 games for Hampshire when they take on Essex at the Ageas Bowl on Friday. The 31-year-old Zimbabwean has been with the county since 2005, helping them to the title in 2010 and 2012. But last season, despite top-scoring in their semi-final with Surrey, Ervine could not lead his side into the final. "I'm stoked really. It's quite an achievement, I'm very proud about it," the all-rounder told BBC Radio Solent. Ervine has helped Hampshire to four T20 Finals days and says he has fond memories of his time in the competition. 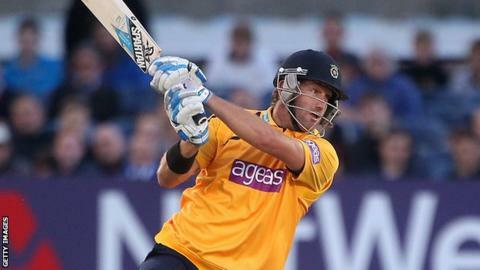 "I started really young and was given the opportunity back in 2005 to play T20 cricket for Hampshire," he said. "It's been a long journey and luckily I haven't had too many injuries during the T20 block. I'm very excited and hopefully we can mark it with a win. "It's been a great six years. Trophies and finals days left right and centre. "It's been exciting and it's good to see the youngsters come through the ranks. It's been a good group and a great squad over that period. Shane Warne led the way and together with good preparation and tactics it's worked."